Later topic: Are these etching plates? Yesterday the Southern California Chapter of the American Printing History Association visited the Abbey San Encino, built by printer Clyde Browne in Los Angeles in the 1920s. Browne’s printing operations ceased with his death in 1942. There is a single piece of equipment left in the Abbey, shown here: imgur.com/a/Wdgpa. It may be only part of something. The Abbey’s current resident, Clyde Browne’s grandson Severin, is curious to know what it is. Any ideas? It is obviously bodged-together, but what it is is anybody’s guess. 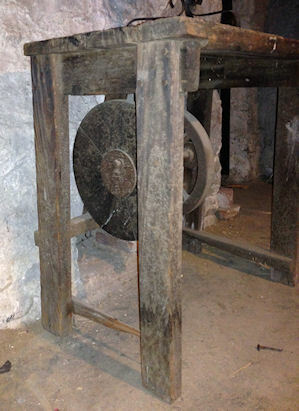 The simple wooden frame (pegged half-lapped joints), the metal flywheels and the wrought iron tripod on top do not come from the same era much less the same source. They have been pieced together, sort of like the Piltdown Man. Was Browne a practical joker? Is there anything on the surface of the table that shows missing mechanisms? The offset bolt on the right end suggests a missing crank and treadle. Thanks for looking, parallel_imp. I should have mentioned that the wrought-iron piece on top is not part of the contraption. It’s a candlestick. The top is solid wood, like a tabletop. OK, I give up. I can’t seem to access the image. I did goggle the Abbey San Encino and find it to be absolutely fascinating. WOW! Wonderful pictures and even a great You Tube video - but nothing I could see fitting the general description of what is being asked about. Could someone post an image we can open here so we can try to slueth this out? Sorry, Rick, that the link didn’t work for you. I put it on imgur because you can upload larger files there than you can here. I’ll post a a couple of pics here, too. It looks like there are a couple of eyebolts under the “back” cross-brace, which could have held the back end of a treadle. Are there any holes (through, or for screws) in the table-top? 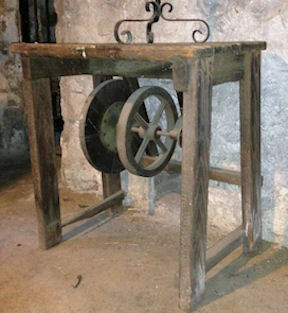 This could have been an adaptation for something like a jig saw or scroll saw to be treadle-operated; there appears to be an eccentric on both ends of the shaft. I can’t visualize how it could have been used for printing, though possibly for some other bindery operation like stapling. And it looks like the left side brace is an old chair spindle or some such with wear on one end. The pictures came through just fine Barbara. Never seen anything like that before. Looks like a mystery wrapped in an enigma. I cant quite get around its purpose but a quick assumption frrom me is that it may have been a treadled power source as opposed to a machine in itself . Put a small press behind it and a boy in front with a treadle he could power away and tidy the work on top of it at the same time???? 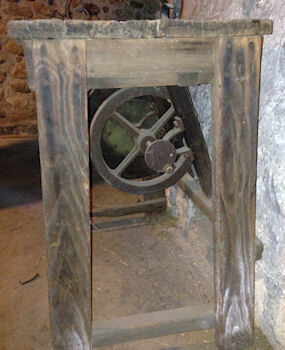 With ref to having two eccentric fix points one appears to be either side of the flywheel , attach a cranked rod of equal length to each and let them hang down , attach a length of lumber across at the base of the two rods and you will effectively have a pedal set, put one foot next to the left rod and one next to the right rod and you should be able to pedal it . There is a bit of heath robinson in that but its a principle that works !